>A robust variety of coverages for your clients' small businesses. Proprietary BOP product, Workers' Comp, Commercial Automobile, & Commercial Umbrella. In today's data driven world, organizations of all sizes are at risk for a cyber attack or data breach and one study suggests the average cost to rectify a breach has risen to over $6 million. Just one stolen laptop, one resourceful hacker, one virus or even one lost paper record can create enormous financial and reputational consequences for a business. It may not be a question of if your organization will suffer a breach, but when. Will your clients' businesses be prepared? Available for organizations of all sizes, Travelers CyberRisk is offered as a standalone policy or as part of a broad suite of other management liability coverages. CyberRisk provides a combination of coverage options, including pre-breach services by SymantecTM and access to the Travelers eRisk Hub® powered by NetDiligence® for tips and tools that may be helpful in avoiding a breach. For whom is this right? Organizations of all sizes from small businesses to Fortune 500 companies and every organization in between-including financial institutions and nonprofit organizations. CyberRisk is part of the modular-designed Wrap+ Executive Liability for Private Company product. Learn more about the Wrap+ product, and log in to Big "I" Markets to submit a quote. 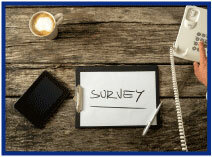 In an effort to better understand Big "I" member utilization of agency call answering services, we are gathering some anonymous data through a brief survey. Will you take just 1-2 minutes of your time to let us know if and how your agency uses a third-party live answering service to pick up your agency's phones (24/7, during lunch, after hours, etc.)? Thank you for your participation and please feel free to contact brett.sutch@iiaba.net with any questions or additional comments. Employment Practices Liability Insurance (EPLI) includes coverage for defense costs and damages related to various employment-related claims including allegations of Wrongful Termination, Discrimination, Workplace Harassment and Retaliation. Your business clients may think an employment practices claim will never be made against their organization... but they should think again. Employment related claims impact organizations of every size, in every industry and can disrupt businesses, hurt employee morale, damage reputations and cost businesses financially, even before going to court. With exposures leading to employment practice claims increasing over the years due to economic conditions, demographics and the ever-evolving legal environment, it is important for business to protect their bottom lines. Travelers helps businesses understand and demystify Employment Practices Liability coverage. Employment Practices Liability Insurance is part of the modular-designed Wrap+ Executive Liability for Private Company product and is currently available to insureds in all states with the exception of: CA, LA, NE, NV, VT and WV. Learn more about Wrap+, then log in to Big "I" Markets to submit a quote. Workers' compensation, as a coverage, is simple. A worker gets hurt and, theoretically, the work comp policy pays; that's the simple part. The more complicated areas of workers' compensation involve the state laws and legal doctrines applicable to workers' comp. During the Jan. 10 "Workers Compensation: 5 Mistakes Every Agent Makes" webinar, VU Executive Director Chris Boggs will address five areas of confusion: For whom is the insured actually responsible under workers' comp laws? Who counts as an employee? What happens when employees travel out-of-state to work? When should insured's experience mod be combined? What are some of the key premium audit problems? Agents must be able to answer these questions when they arise, but there is much confusion and misinformation surrounding these topics. Attending this session will help agents to better manage their client's usual and unusual workers' compensation exposures. All Big "I" Virtual University webinars include a 'seat' to attend live, a link to the on-demand recording, and a written transcript. Consider presenting conference style for the entire agency to benefit from the information shared. 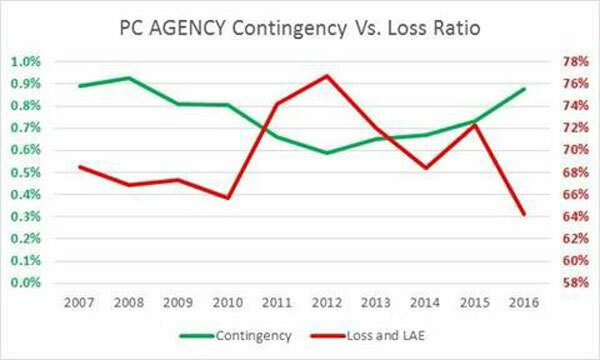 Source: 2008 to 2017 A.M. Best Aggregates and Averages, the "Summary of Operations" for US PC AGENCY exhibits and the Insurance Expense Exhibit for the same group of PC AGENCY insurers (Part I - Allocation To Expense Groups, Part 2. "Commission and Brokerage" and line 2.4-Contingent - Direct). I came across this data while I was looking for average P&C agency commissions in the Insurance Expense Exhibit that each insurer files as a supplement to their annual statutory annual statement (12.7% is the 10 year average). While I was at it, I grabbed the data necessary to calculate the industry loss ratio on a calendar year basis for the the A.M. Best's "PC AGENCY" grouping. The contingency data is over 80% correlated, albeit negatively, to calendar year loss ratios. That is, about 80% of the variance in the ratio of Losses and Loss Adjustment Expenses (LAE) divided by Earned Premiums is reflected in a change in the opposite direction in contingency income paid. Congratulations to our agent in Kansas on an Affluent Homeowners sale of $5,441 in premium!